We All Need a Pair of Huggie Earrings, and These are the Ones We are Wearing These Days! Jewelry never really lose their charm, they are right there all over the prominent parts of your body, screaming for attention and dazzling on the spot. Well, if you want to increase the tempo and impress more than ever, you should check out huggie earrings. Yes, you read that right! Huggie earrings are just as impressive as their name sounds; they are one magnificent product that completes your fashion statement. Rigging the whole attention at the party and showering your ear with such twinkle that it becomes impossible to look away. There are indeed a lot of reasons that you would be charmed by the light-catching and dynamic resplendence of huggie earrings. If you haven’t still caught on the excitement that exploring this dashing piece of jewelry would bring to you. Don’t worry, we have packed this article with fantastic pieces that would get you out there and throw the spotlight all around you. You might be wondering if the tone of excitement used to introduce huggie earrings isn’t over-reaching. Well, it’s not, for a product that can spark up your ear and complete your fashion statement with such aplomb. It really brings out the beauty in your outfit, and you can even use it in combination with other jewelry in a perfect accord of wonder. Huggie earrings got their name from the fact that they hug the ear piercings, they are just like your regular hoop earrings, except they are the ‘slim fitted’ version. They also have a post that fits between the two halves of the hoop. So you can take them off and put them back on without worrying about comfort. Huggie earrings were pretty popular through history, but the place they started can’t actually be pinpointed. The only thing we can say is that ear piercings and earrings were pretty popular in ancient Egypt. And pirates also wore them quite well. Why you would love them are because of the diversity, it does not come in only just one material. One brand can fashion theirs with gold and use diamond accents, while others can choose to use sterling silver and create a subtle shimmer using topaz or any other gemstone. There is so much creativity that can be infused into this earrings that it is like a mural for brands to create wonders from. If you are looking to join any fashion trend and want to check it out if it’s the ‘in-thing.’ Then check fashion magazines or pay more attention to red carpet event, you will certainly find it on celebrities if its ‘cool.’ This is precisely what we did for Huggie earnings, we wanted to be sure you had the best, and so we checked. 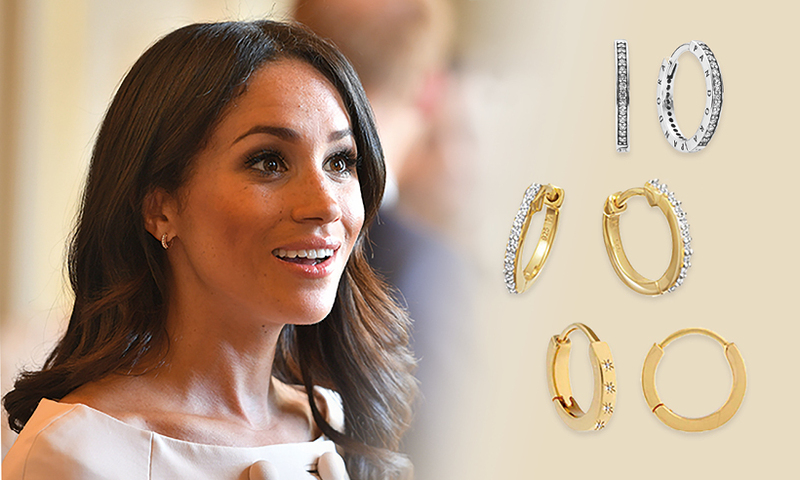 The first person that we found wearing a beautiful piece of huggie earring is the Duchess of Sussex, Megan Markle. She was sighted at a recent public appearance with a pair of beautiful Vanessa Tugendhat ‘Parisienne’ diamond huggies. Dana Rebecca was also spotted at a red carpet event with her awesome smile right where it should be and a pair of diamond huggies, twinkling on her ears. Angelina Jolie is not also left out of this trend, and even the Kardashians use them to decorate their ears from time to time. We hope you get the euphoria by now. And that’s why we have created a list of all the awesome huggie earrings that will spice up your jewelry collection. Check them out! This beautiful masterpiece is quite an accessory to be fascinated with. They come with a chic and elegant design that will look absolutely fantastic as they hug your ear. Crafted by expert hands, there is every guarantee you need, woven right into the material of the earrings. They were made with stainless steel and perfected with black finish. It has an exquisite feel when you look at the blend of black and silver that is absolutely amazing. For it to be perfect for your ear, it has a length of 15.5 mm and width if about 5.8 mm. You can also take advantage of the 4.6 grams it weighs to enjoy maximum comfort. We love the fact that this earring is simple, yet so great that it appeals to the eyes and looks quite stunning. Also, the amazing hinge joint allows you to take them on and off quite easily without going through stress. The stainless steel used is durable, and they come at a great price too so you can get one for yourself without checking with your bank. November gemstones are quite unique, with their orange glimmer and dazzling beauty, it is quite hard to resist their charm. 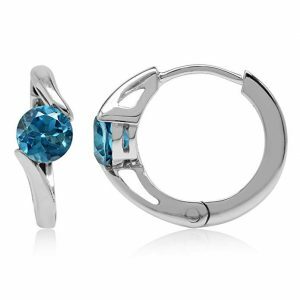 And this is the gemstone, Gemstar USA used to create a gorgeous huggie earrings. From one of the best brand in the market, these earrings have superb quality and are a mix of beautiful materials to make a perfectly awe-striking product. You can count on being satisfied with the polish filigree setting used in crafting it. These huggies were created with fine sterling silver, which is one of the highest quality metal used for jewelry. It doesn’t peel and is hypoallergenic to your skin. With the infusion of three citrine stones, there a harmony of beauty that just seems right. Each of the stones is 5 millimeter in diameter to enable them to fit perfectly into the whole setting. So with this touch-up of classiness, you can get your accessory collection to have that life it’s been missing. Gemstar didn’t stop at just making the earring with November gemstones; they also recreated the awesomeness in a series of other earrings feature in this collection. So you have a vast array to choose from like stimulated opal, blue topaz, cubic zirconia, created ruby, peridot among much other design. School prom. Night party, red carpet event, there is absolutely nowhere you cannot wear the earrings to. You can also get one for your loved one, and you won’t need any extra packaging since they come with a cute pouch ready for gifting. Here is one jewelry piece that will soon become your favorite. With a pave setting that is not only perfect for you but also beautiful, you can wear it in whichever piercing you have in your ear. 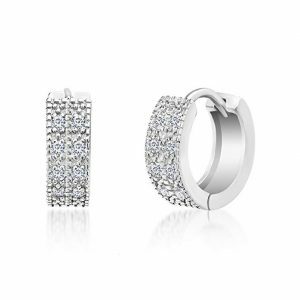 This huggie earring also combines the great feature of a stud for a better experience. Pavoi is one of the leading brands of jewelry in the market, form earrings to necklace and bracelet, they make quality products by employing the services of experts. 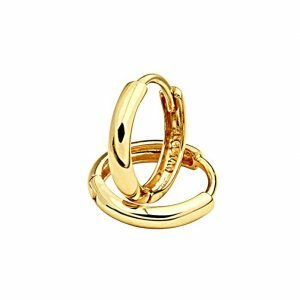 This 14K gold plated huggie earring is made with sterling silver and measures just about ½ inches in diameter. 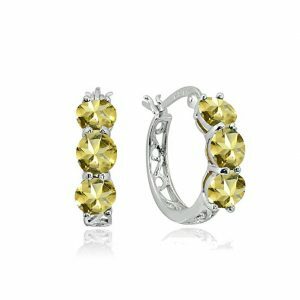 With cubic zirconia lining up all the surface of the earrings, the aesthetic appeal is pretty cool. You won’t need to worry about any allergy since the material is free of nickel or lead. You would love these earrings with all the fantastic features that surround it, there is the setting, long-lasting finish, the elegance, and the affordability. Have you ever seen priceless jewelry that has so many gems it looks like it was pulled straight out of a magical world? Well, you can have just that and at a reasonable price too. This is one huggie earrings that you simply want to get. With a timeless design and perfect gem finish, you can get that stunning effect that is nothing but excellent. The earrings were created with high-quality stainless steel and decorated with gemstones. What makes the design unique is the different color of cubic zirconia used to replicate the various gems. There’s blue, pink, red and orange all mixed together in a wonderful setting.And the brand uses the hands of professionally skilled craftsmen to shape each detail into perfection. Each of the stones is round and have a diameter of 2.3 millimeters. Naturally derived, the earrings were made with utmost care to guarantee that they are the keepsakes of generations to come. It is also hypoallergenic, with no rust and free from tarnish. If you are thinking of getting a gift for your loved one or you just need something to spice up your collection, then this is the perfect choice for you. It even comes with an additional perk of letting you donate a hot meal for one hungry child through a one on one program that’s all part of a ‘help child fight hunger program. Just click on the link above, and you will definitely be getting one of these earrings. Huggie earrings are great for so much reason, and apart from the fact that they are perfect for your ear, they are so much fun with their beautiful design. They can be decorated with gemstones, zirconia and even alloyed to make them the perfect accessory. This is one huggie earrings from Silvershake that is worth having. With the topaz gemstone that was added to it, it has the sort of effect that captures the spotlight. 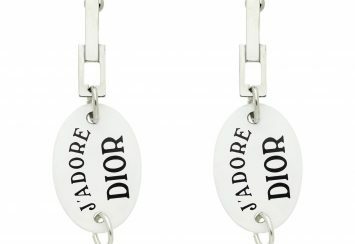 The metal on the earrings is 925 sterling with silver rhodium plating. The topaz weighs 1.24-carat in total and features a natural cut. There is no form of radiation in creating it, and the cut was done with absolute precision for great curve and excellent edges. You can rely on the hidden-snap-post to help you secure it right in place at your earlobes. And you can wear it all day without worrying about damage from moisture or environmental chemicals. There is the stylish awesomeness that goes around with you all day and night with the use of these. You can count on the white gold plating to help maintain its durability, and it’s even affordable too. 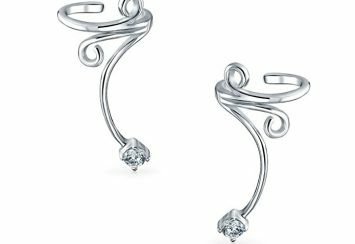 Earrings are quite pleasant when it comes to gifting, you can get them for anyone who has ear piercing. This particular product comes with exquisite design and glamorous crafting. The classic beauty makes it suitable for just about any outfit, and with an IGI certificate, quality is certainly guaranteed. One thing that makes jewelry safe to wear is the material with which they were made. These beautiful and gorgeous huggie earrings were crafted with 14K plated metal stamp, this is one of the highest quality you will find in the market. However, the first thing that captures the light in the product is the 8 stone naturally cut round diamond accent that twinkles on each hoop. It’s quite remarkable what gemstones can do to a product, and the 0.48-carat diamond simply does wonders to this one. You can be sure that you won’t lose your charming jewelry at any party, whether at the pool or that dinner you are going for. This is because of the hinge and notched post that is used to hold it in place on your earlobe. Take one look at the image above, and it speaks what a million-word can’t, those diamonds are truly clear, and they will certainly spark up your face with their glimmer. Several jewelers use cubic zirconia to add a touch of beauty to fashion accessories while making sure that you can afford them. There’s this excellent shine about them that causes a sparkle just like the gemstone they are used to imitate. They are very versatile and can be colored for various aesthetic pleasure. MIA SARINE certainly got it right this stunning piece of huggie earrings. Crafted with sterling silver, the earrings are hypoallergenic and great for your skin. 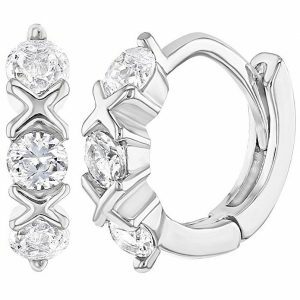 There are cubic zirconias used all over the round hoop in a pave setting that is quite charming. You can create a spark of life for your wardrobe with this timeless jewelry. It also has a click back to keep it from falling off at any time. You don’t need to worry about budget cuts when you want to get the earrings, the price is pretty moderate. There is also the soft but beautiful pouch that was used in packaging the product, which is goof for storage anytime you wish to take it off . They are an excellent idea for any type of outfit, and you can be sure that they aren’t going out of vogue anytime soon. Be it prom day, Christmas, mother’s day, birthday, wedding anniversary or any other special event, these huggie earrings are lovely with its beauty, elegance, and stunning quality. If you are all about gold earrings, then you would be taken with this masterpiece. 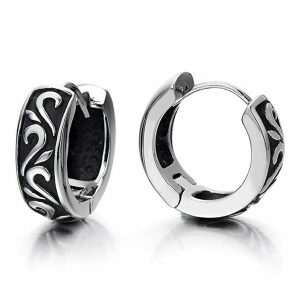 From a global brand that is well known, these huggie earrings have all the components that will befit your ear perfectly. There is the lightweight and the simplicity with which it hugs your ear and complements your beautifully. With so much radiance, you will be the cynosure of anywhere you walk into with this gorgeous accessory. Measuring just 10 millimeters, these earrings are an excellent fit for your piercings, whether you are new or not. The 14K gold plating used is very durable and won’t start peeling anytime in the future. You can also trust the convenience when you need to take it off or put it on with the notched post attached to it. One more super awesome feature here is the shine and luster finish that reflects lights beautifully. There are very few earrings that are in this class that comes for the price range that the earrings is sold. And it’s a fantastic choice for anyone with the comfort and class that it provides. You should definitely have it in your collection of gold jewelry, so check it out, and you will soon be getting one for yourself or for a loved one. We decided it wouldn’t be so great not to add something for the little ones in our huggie earrings collection. If you have a little girl and you are thinking about what to get her for her next birthday or that performance she has coming up, then think no further. With a jewelry piece that is enthralling and sits perfectly at the ears of children, these small huggie earrings will undoubtedly be excellent for the ears of your child. 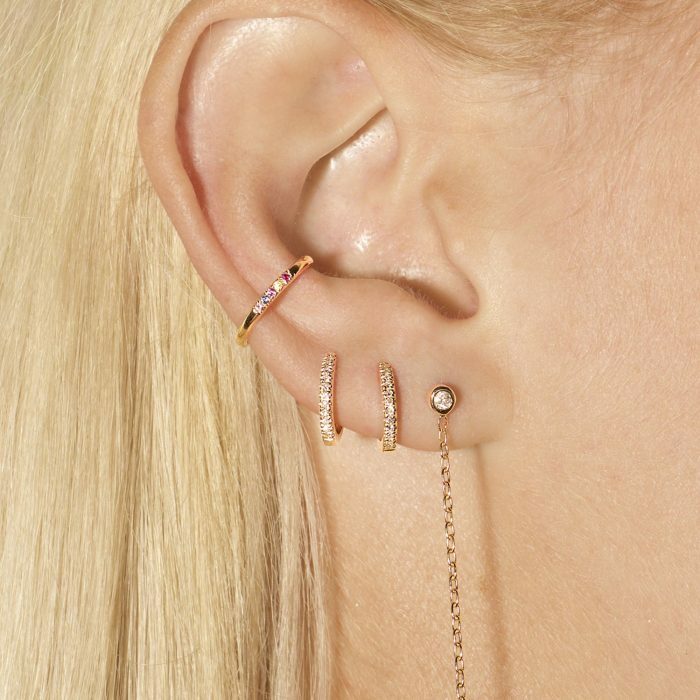 One thing that makes huggie earrings unique is the way they fit perfectly into your piercings and curl right around your earlobe like a ring. This is why for infants the dimension of these earrings is just 10 millimeters. It will fit your any child and is ideal for everyday use. Apart from the fact that it fits well, the design that was crafted into the earrings is also something to be excited about. There are three cubic zirconias set inside a 925 sterling silver metal. All the sparkle that shimmers off it will do well in complementing the ears of anyone who wears them. Get one today, and your child will never want to take them off. The classical hinged clasp is also there to help stop them from getting lost. This is one splendid earring that you can buy for your child, and it is also safe for the skin and comes in a gift box that saves you the stress of further packing it. 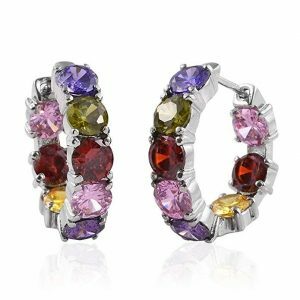 Our list of best huggie earrings won’t be complete without adding something that has an exquisite design with its dazzling color. The earring is made with total expertise. It has all the perfect combination of color, and the red stone that dangles from the round earrings shines perfectly with its silvery backdrop. Sterling silver is the signature metal used in crafting the ring of the product. With its hypoallergenic feature, this is one material that you should make you feel comfortable. The elegance comes in the fusion of cubic zirconia stones all around the hoop, and this creates an amazing sparkle anywhere you go. 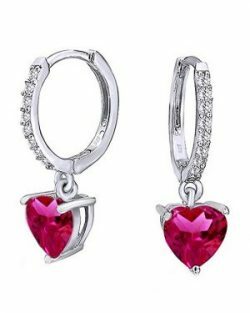 To make this jewelry even more appealing, the expert craftsmen at Wishrocks put a simulated ruby shaped like a heart. What you get at the end is a fashion piece that combines beauty with elegance in one impeccable package. The earrings also have a post-with-snap-down clasp to help you make sure you don’t lose it anytime soon, you can count on the pretty great cut and ideal dimension for maximum comfort. There are also other varieties you can choose from like the pink ruby, amethyst, simulated peridot among many different ranges of choice. Just check the link for all the various options. It is perfect for any event that you want to attend. Just tune up your style volume and use it to complement a silver gown or that wine outfit that you have been dying to wear for quite a while. You will certainly be at the center of everyone attention with all the attention-grabbing sparks flying off your ears. Just to clear some of the questions that are still stopping you from going for one of the amazing huggie earrings we have discussed. Here are some of the questions we found that is quite common about huggie earrings. 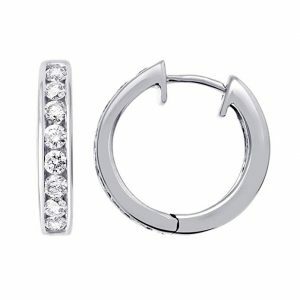 What is the difference between huggie earrings and hoop earrings? They sure look like hoop earrings, and in fact, they come in circular shapes which is precisely like hoop earrings. The key to their difference is however in size. 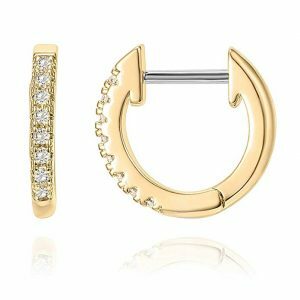 While hoop earring tends to be big and dangle well beyond the ear size, huggies just stay right at the edges of your earlobe. They are a perfect fit and you they can also be decorated with beautiful scent for alluring features. Also, they range in sizes, so check the dimension before you get one for yourself. There are indeed ways to make sure that you keep your jewelry in perfect condition so that it can fulfill its durable property. If you own a huggie earring or you are looking to buy one, then here is how to clean it. The first thing is to make sure that you don’t throw away the pouch it cares in so that you can keep it there anytime you are not wearing it. If you bought one of the more expensive options or the ones with natural stones, then you might want to take it to the jeweler near you to help you clean it once in a while. You can also use a soft cloth to clean it anytime it gets a bit dusty. Yes, they definitely are unisex. If you are a man, you can use this awesome jewelry as long as you have a piercing. It doesn’t matter the size of the piercing, you can certainly find one that suits you perfectly. It’s also available for women with a different design for everyone. You can also check the third section in this article to see some of the male celebrities that have rocked the earring to several events.